Another Xmas card under my belt. I think today I'll update my database and allocate the ones I've made to an actual person... Big Job. I digress. I wanted to make a simpler card in contrast to the more involved cards I've been making recently. Also wanted to paint and wanted a poinsettia... So this is the result. I stamped the image (Local King Rubber - and I'm so looking forward to seeing them again this year at one of our Xmas craft shows at the Telus Center - I'll be spending bucks!!) 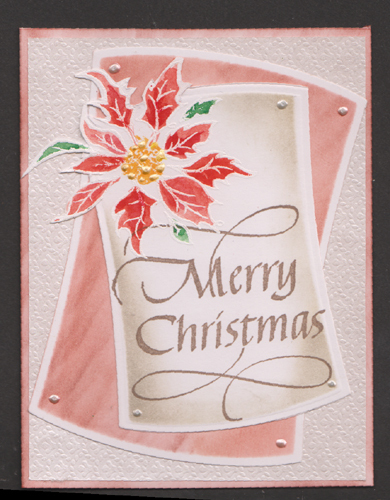 with Perfect Medium and embossed with white embossing powder on white cardstock. Painted the image with Daniel Smith watercolors, then cut part of it out to fit my die (Spellbinders Reverse Wonky Rectangles) underneath the petals. 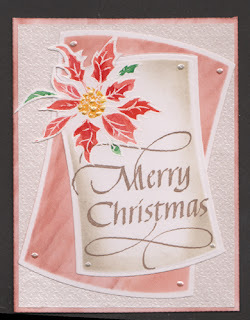 Sponged Pumice Stone around the edges and stamped my sentiment Quietfire Design with Versafine Vintage Sepia. Die cut the largest of the rectangles and sponged with Aged Mahogany - just having a soft coloring. Main card was white (4.25"w x 5.5"h), sponged edges with the Mahogany, Layered a patterned white metallic paper, then my wonky rectangles. Added Liquid Pearls, yellow in center of flower and white pearl as faux brads. I like the simplicity and softness of the card. So cheerful and pretty! The colors say Merry and Bright! !